The Detroit Zoo will light up the night this holiday season with Wild Lights, a spectacular light display presented by Bank of America. More than 5 million twinkling LED lights will brighten the evening sky and illuminate buildings, trees and more than 100 animal sculptures on a trail through the front half of the Zoo. 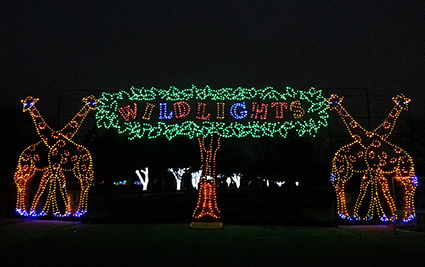 Wild Lights will be held for 24 nights, 5:30-9 p.m., Nov. 20-22 and 27-29 and Dec. 4-6, 11-13, 18-23 and 26-31, 2015. Admission is $9 per person in advance and $11 at the gate for guests ages 2 and older (children under 2 are admitted free); parking is $6 per car. Tickets can be purchased online at detroitzoo.org/events/wild-lights or at Detroit Zoo main admissions, and will also be available at all Michigan Kroger stores. Wild Lights guests can take in the lights and sights while enjoying holiday entertainment and activities for kids of all ages, including ice carving, arts and crafts and the Wildlife Photographer of the Year exhibition. Guests can soar down a new 20-foot-tall, 150-foot-long snow slide ($3 with admission) and take a spin on the Carousel ($2 with admission). “The Polar Express 4-D Experience”, a 14-minute adaption of the feature film starring Tom Hanks, will be shown at the Wild Adventure Zone’s 4-D Theater ($5 with admission). Children under 2 are admitted free to all three attractions. Seasonal refreshments, holiday spirits, photos with Santa Claus (until Dec. 23), Wild Lights souvenirs and zoo-themed holiday gifts will also be available for purchase.